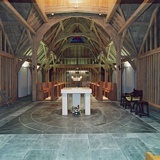 Delabole Slate flooring has been used by builders for hundreds of years. In the 16th century crude "riven" slabs would have been sold, hand-split and dressed in the quarry. Over time these have been smoothed by constant use and foot traffic. In the mid 19th century, great water driven frame saws were introduced and sawn slabs became the norm. You can see a picture of the old water saws that were in operation at Delabole on the product information page for Slabs, Sills & Hearths. This is no ordinary slate! Mother Nature created a unique material as she re-crystallized sedimentary deposits originating near the equator 350 million years ago and transported them by techtonic plate movement all the way to Cornwall. 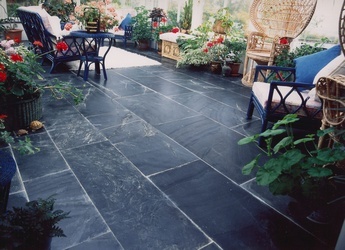 When cut through, Delabole Slate is brought to life with attractive natural markings and subtle variations in the predominantly Blue-Grey colour, assuring that every product is unique. Time tested Delabole Slate Floor Slabs, Flagstones & Tiles are virtually maintenance free and ideally suited for a variety of demanding applications such as kitchens, hallways, pubs, restaurants, foyers, and shopping centres. The mineral composition of Delabole Slate provides the hard-wearing properties that ensures its excellent durability and long service life that is measured in centuries. Flagstones made to order and sizes up to 6ft x 4ft (1800 x 1200mm). Traditional Random Slab Flooring in set widths from 9" to 33" (225-840mm) in 3" (75mm) increments and random lengths up to 6ft (1800mm). Sawn Tiles up to 30" x 20" (762 x 508mm). Riven Tiles up to 16" x 16" (406 x 406mm). Riven Slabs up to 24" x 18" (610 x 457mm).